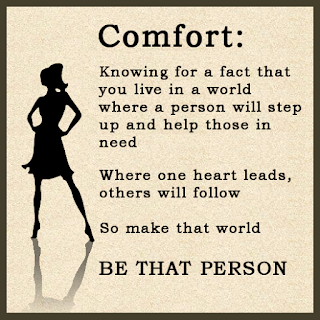 I hope this comes across as intended: help others fearlessly, confidently, simply because it's right. On the face of it, it's right. If you live your life expecting that good deeds will earn you rewards in equal measure from the people for whom you do them, then you will be disappointed. That's because that's not what you're supposed to be doing. You can do it right instead. FIRST: It magnifies negativity. Everyone knows that feeling of disappointment when you expect the people around you to behave more kindly toward you than they do. It's important to acknowledge those feelings, and there's nothing wrong with that. But this meme is basically a piece of advice, that's not what advice is for. Advice is for taking action to deal with the emotions after you've acknowledged them. This meme basically invites you to dwell on disappointment: to avoid future action due to the assumption that you'll always (or frequently) be disappointed. I think there's much better advice to be had. "All things therefore whatsoever ye would that men should do unto you, even so do ye also unto them: for this is the law and the prophets." Your disappointment comes from your expectation, and that's what needs to change, because you may be missing out on something much better. 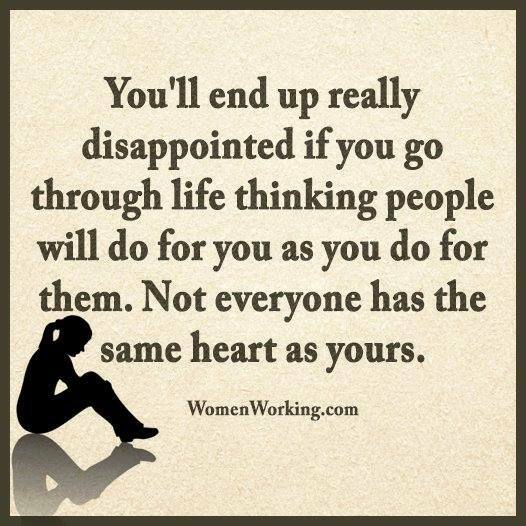 THIRD: No one has the same heart as yours. 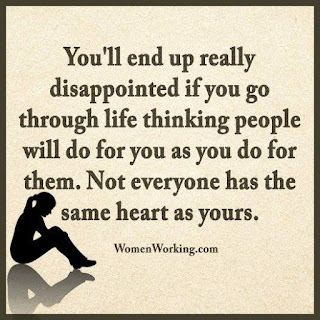 But most people have a heart like yours. They respond to kindness in kind. Someone has to go first, so why not you? Why not me? And sure, not everybody responds in kind. Not every smile will get you a smile in return. Some people are just grumpy. Some are sad for reasons that have nothing to do with you. Some may have even listened to poor advice from Internet memes and have built walls. Some are suspicious because they, too, have listened to cynics and are looking for "the catch". Some were never taught the golden rule as it should be understood. Toss them the smile anyway and keep walking so you can toss a few more at others. They may not return your kindness today, or to you; but they will remember that it was given freely. There was no catch. The cynics were wrong about you. And somewhere, sometime, that grumpy person will be kind to someone... just because it's right and because they had your example. Here's the funny bit about that heart. You feel disappointment only if you are willing to give kindness. And if the cynics are wrong about you, then they are wrong about a lot of people. Because contrary to what some big purple dinosaur may have told you as a child, there are a lot of ways in which you are not unique. You are not unique in having feelings. You are not unique in feeling gratitude. You are not unique in being human. When you stop to consider that we all share our humanity, it opens up an entire new world of realization. There are many people like you. And if you're willing to help, they are too. If there's one person who's willing to help, there are millions. But the only mind you know is your own. So the only way to ensure that there is one is by being that 'one'. And here's something else to think about: if someone else just gave you that piece of advice, you know for a fact that you won't be alone. All you have to prove is that it's true for you. So consider what's "in it for you"... a city, a town, a country, or even a world, in which people are taught to be charitable for the sake of it... freely, cheerfully. Even if not everyone is so inclined, this is still an infinitely better world than one where people are tolerable only out of fear of the law, not because it's right; where they do not support those in need of their own accord, but only because they are forced to contribute so that someone else will do it for pay; or because they desire the benefit. FINALLY, the advice is just plain faulty. It's wrong because following it doesn't make you a better person; nor does it place you among better people. The implicit advice given by this meme is that you shouldn't treat others as you would have yourself treated, because they wouldn't do it for you. As advice is ranked, perhaps it's slightly better than Jim Jones' invitation to "have some Kool-Aid." I'm not kidding. Taking this advice can screw up every relationship and personal interaction in your life, for the remainder of your life. It invites you to be selfish and standoffish at best, and others will respond in kind, because they do have hearts like yours, and will not take kindly to such poor treatment. 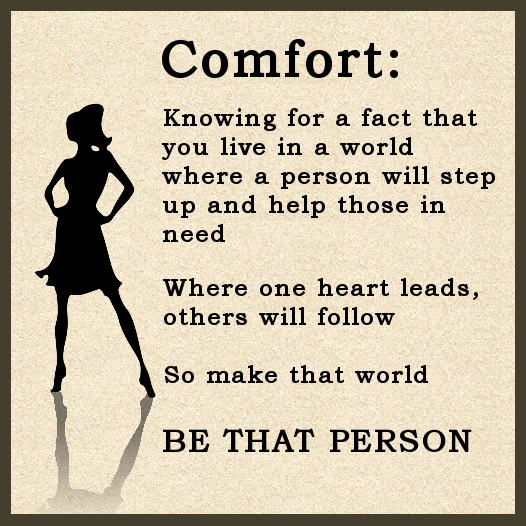 Wouldn't it be a comfort just to know for a fact that you live in a world where if someone truly needs help there is a person who will step up and give that help?